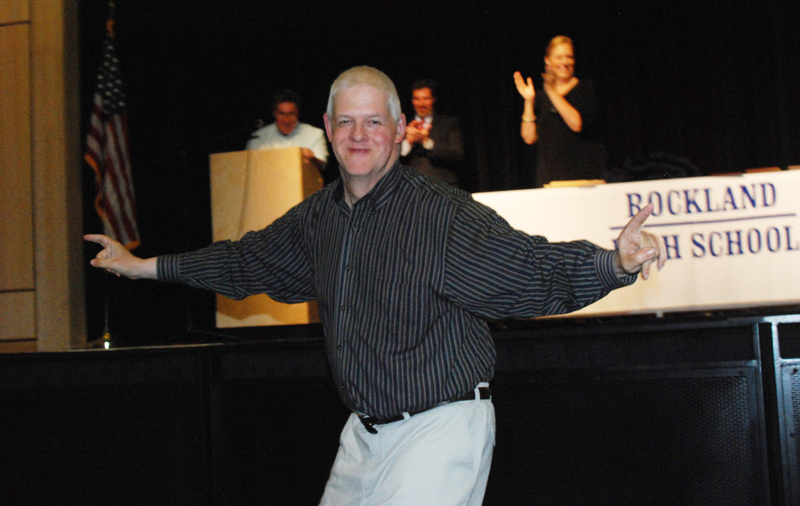 Jim Cahill at the 2013 Senior Banquet. Through the years at Rockland High School one person has always been there as a Bulldog fan. Jim Cahill, English Department Head, Carol Cahill’s youngest brother, is a familiar face to all at RHS and in the town of Rockland as well. Whether it be exceptional attendance at RHS athletic events, yearly presence at the town’s Holiday Stroll, or all around support and good spirit for all things Rockland, Jimmy or “Jimbo” as he is affectionately known, has been one of the town’s biggest fans and supporters. Ms. Cahill recalls that growing up with her family in Rockland, all of Jimmy’s six older siblings, attended RHS. However, Jim attended Cardinal Cushing School in Hanover. Despite this, he maintained a connection to the community by attending school activities such as sporting events, plays, and fundraisers. Recently, Jim has had some health issues. In the beginning of this school year he had lung surgery at South Shore Hospital. In January, he again needed surgery this time at Brigham and Women’s Hospital in Boston. It was then that Jimmy wrote to the students and staff of RHS asking for their support. After Vice Principal Kathy Paulding shared the letter with RHS faculty and staff, students and staff rallied together to send many warm wishes of good health and a speedy recovery. English teacher, Christopher Neal had his students sign and make cards while English teacher Kristen Walsh came up with the idea to make a get-well video. With the help of digital media and journalism teacher, David Cable-Murphy and his students, particularly senior Molly Grass, kids and teachers were filmed wishing Jimmy a speedy recovery. Additionally, RHS’s athletic director, Gary Graziano gave Jimmy some Bulldog pride t- shirts to go along with Principal Dr. John Harrison’s gift of a cozy Bulldog blanket. Rockland has always had the reputation as a determined underdog, and has also been known to support and encourage those such as Jim. This pride and love for the town is what inspired the Cahill family to create the “Jimbo Award” fifteen years ago. Last year, Jim presented the award to winner, Joseph Yeadon. All in all, the Bulldog community is looking forward to seeing Jimmy back in good health at RHS, where he will always have a spot in the stands, and a special place at any RHS event.